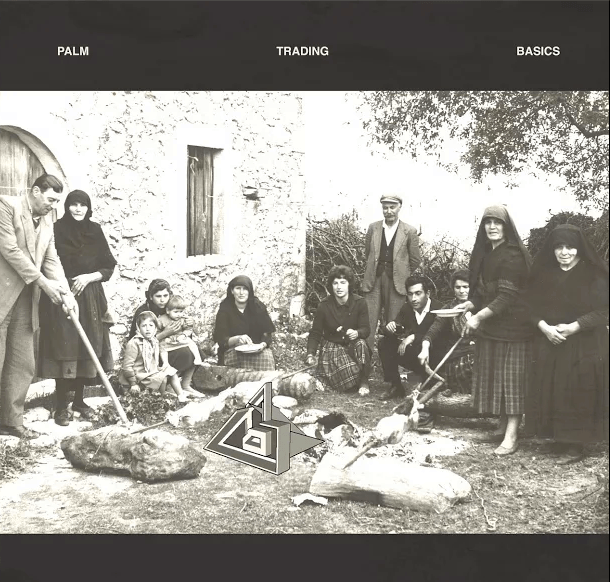 Palm is a truly singular, exciting new group – special emphasis on the singular part. Anybody who reads music reviews knows that one of the critic’s most useful tools (crutches?) is the comparison. If your endgame is to convey to the reader – in text – some idea of an artist’s sound, then the comparison is the obvious shortcut: X sounds a lot like Y and kind of like Z. Comparison has a narrative function too. It tells a story by disclosing a context, connecting the artist and his or her music to influential precursors and like-minded contemporaries. So what does one do when comparisons fail? Writing about the Philadelphia-by-of-way-of-Bard College band’s excellent debut album Trading Basics (out November 6, 2015 via Inflated Records/Exploding in Sound Records) is kind of like wandering into unknown comparative territory. Categorization of the band’s knotty, discordant and often beautiful music is an exercise in “almost-sort-of” and “kinda-but-not-really”. It’s rock music… at least in terms of instrumentation. It’s punk… in spirit. It’s certainly virtuosic… but probably not in the way you’re thinking. That’s not to say that Palm comes out of nowhere. The band certainly falls under the Velvet Underground/Captain Beefheart umbrella of rock experimentalism and has an affinity with avant-pop groups like Erase Errata and Deerhoof (bands with whom Trading Basic’s producer Eli Crews has worked), or even the late, great Krill. But all these comparison feel off because Palm is that rare band that has its own thing. That thing manifests itself on the album opener “Time Times Three,” a short instrumental track. Though the song doesn’t feature drums or bass, the guitar interplay between founders/singers/guitarists Eve Alpert and Kasra Kurt is key. They start with gleaming trills and then open it up slightly. One plays trebly appregiated chords in a repetitious, rhythmic and hypnotic way while the other, with a slightly more overdriven guitar, provides a backdrop of off-kilter tones, sliding up and down the guitar neck. It’s wonderful, weird, and only half of what Palm can do. The following tune “Crank” is a full band endeavor and one of the best songs on the record. The bass and drums, courtesy of Gerasimos Livitanos and Hugo Stanley respectively, are simply fantastic, locked-in with jazzy, driving grooves built around odd time signatures and quick shifts that deftly serve the dissonant twang and clang of the guitars. The latter line serves as a meta-comment on the band’s sound: Comparisons will fail, so one has to sit back and hear the virtuosic whole. But that isn’t to say Trading Basics is a record to be more admired than enjoyed. On the contrary, Palm has hooks too. The most instantly accessible song on the record, “Egg in a Frame,” is a veritable indie-rock anthem. It’s a little bit less fragmented-sounding than some of the other tracks, but is still charmingly odd – almost psychedelic. It’s an angsty barb – one meant to hurt – turned into a rallying cry. Listeners can both project themselves and their lives upon the evocative lyric, while soaking in an undeniably catchy melody set to driving rock and roll. Other more hook or groove oriented songs include “Ankles,” “Child Actor,” and album closer “Scribe,” but really every song on the record has its merits, recovering something remarkably tuneful from dense webs of sound. Palm’s music seems cacophonous until at a certain point, you realize that every odd bit and piece is governed by an enveloping sense of logic. Obvious deliberation goes into each part of the sound no matter how fractured or unexpected it may seem. And this bears itself out with repeated listens. The band’s music often seems effortless, but it’s not improv. One senses that everything is in its place, and that it’s in that place for a reason. Every piece of each song fits together like the toothed gears in some complex machine. But then, Palm’s not a machine. Their music is deeply human in a way that particular metaphor doesn’t convey – the comparisons are always just a little off.